In this first unit we are going to look at the five different stages of a sit and go and the optimal strategy for each. We will also show you how to find the SNG tournaments that are full of fish (bad players) and therefore where we can maximise our profits. One other important topic that we cover in this unit is bankroll management in relation to SNGs. If you break a sit and go tournament down, there are 5 key stages, all with very different characteristics and requiring a different strategy to navigate to the end of the tournament and onto the winners podium. Early Stage – this is the first stage of the tournament where the table is full and the first few players will be eliminated. Middle Stage – this stage is after two or three players have been eliminated and the blinds are starting to increase in proportion to the average stack. The Bubble – this is when we are down to the last remaining place where a p[layer can get eliminated and not receive any prize money. Heads Up – this is the battle between the final two remaining players to determine first and second place. During this Unit, we’ll dedicate a lesson to each stage and discuss what the aims are for each stage and what the optimum strategy is for each. But in this first lesson we need to cover some basic topics that will be the foundations of our Sit and Go strategy. 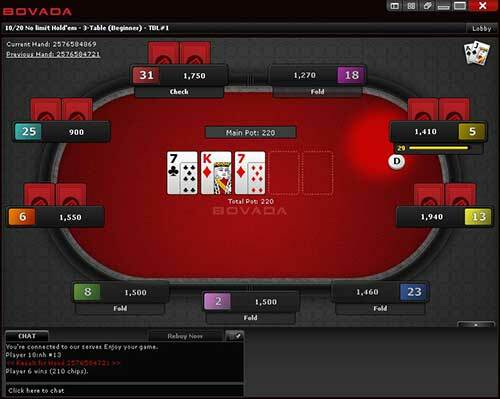 Most online poker sites offer Sit and Go poker tournaments but they will all vary in one way or another, whether it be different blind structures and times of blind increase, through to just a different set of players who play on that site. Having been online since 2005 and with an active community we have tested most online poker sites, some of which aren’t around any more. When it comes to Sit and Go’s there are a couple of sites that we find stands out from the others. The two sites listed above are great for the low and medium stake buy in tournaments. Naturally they get a bit trickier when you move above $50 buy in SNGs with more better players, but this is the same at all higher stakes SNGs across the internet. Our recommendation to you is to start playing your SNGs at one of the two sites above. 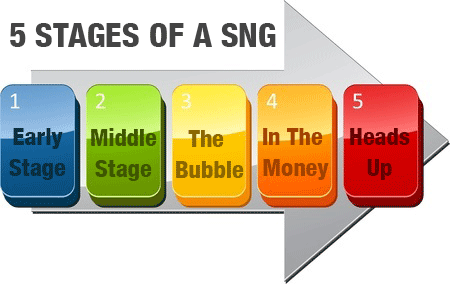 The strategy you are going to learn in this course works just great at the SNGs there and the structures are perfect for the $1,000 SNG Challenge later in the course. If you do not already have an account there, then just click on the buttons above to download and sign up for a free player account. Once you have your new account setup then you can deposit your starting bankroll of $50 ready for the $1,000 SNG bankroll challenge later in the course. Sit and Go Bankroll Management: How not to go Bust! Determining the proper buy in size for Sit and Go tournaments is important. Even for the best players, there is some short-term luck involved in negotiating the table. A bad run of cards or a bad beat can destroy the best player in the world, even against a table full of novices. For that reason, no one should ever risk a significant portion of their bankroll on any one tournament. Doing so causes the player to play too conservatively for fear of going broke. Ideal strategy is to be able to take calculated risks. The best players in the world are always taking risks, but because they are on the good side of the risk more often than not, they come out ahead in the long run. That doesn’t mean they can’t suffer from bad luck on one hand, or one tournament. This bad luck is called “variance” and refers to fact that even if you play perfect poker and with the odds in your favour all the time, there is still a small chance that you can lose a hand or tournament. This is natural in a game of odds and usually isn’t a problem this evens itself out against all the hands / tournaments you win where you ensured the odds where in your favour. However it is possible to suffer from a down swing in luck, where all the bad luck comes at once. Studies of large sample size surveys have found that even long term winning sit and go players have experienced a down swing of 20+ buy-ins on average once every 500 games. That is why we have to protect our bankroll from this sort of variance occurring and ensure we have enough left to build up again once it is over. Of course, that is just a statistic and not everyone is going to experience big down swings like that, some players will see less variance than others. But at least you know it’s normal and no reason for you to get too disheartened about it, and as long as you protect against it, in the long term you will bounce back. For Casual Players – maintain no less than 20 buy ins in your bankroll (so to enter a $1 SNG you would need a bankroll of $20) The reason this is lower is because casual players usually only play with disposable income and if they go broke are able to reload. 20 buy ins will protect you from all but the worst down swings, and will provide more of a challenge than playing for the smaller stakes. For Serious Players – maintain no less than 50 buy ins in you bankroll (so to enter a $1 SNG you would need a bankroll of $50). Serious players need to treat this a business as the aim is to build your bankroll and play at higher stakes and without proper bankroll management you will soon go bust with the smallest of downturns. For the Ultra Conservative Player – If you are ultra conservative, or maybe playing on higher stakes where a downturn will hit you harder, or turbo SNG tournaments where the variance is higher, then you should maintain 100 buy ins in your bankroll to ensure additional protection. For the purposes of this guide and for the $1,000 SNG Challenge we are going to hold a bankroll of approximately 20 buy ins. Then towards the end of the challenge we will start to increase this towards 40-50 times the buy in as we move onto the higher stakes, and ready for you to maintain this 50 buy in level going forward. As explained above this is slightly riskier and you should only attempt the challenge with money you can afford to lose. If you do not want to accept the higher risk then you must either start with a bigger bankroll of 50 buy ins or stake at lower buy in tournaments. Bankroll Management is a personal choice and varies depending on your personal circumstances. The smaller the buy in is as a percentage of your total bankroll the less risk of going broke there is. As mentioned some professionals who rely on poker (and hence their bankrolls) for their income will take less risk with their bankroll and will often hold 75 to 100 buy ins in reserve. 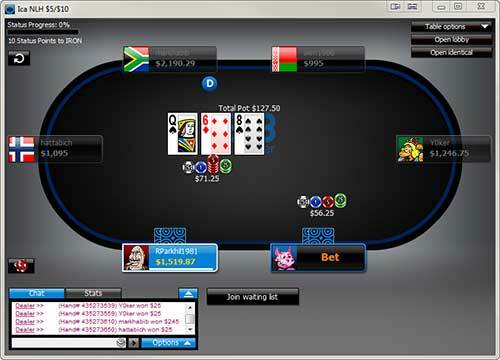 During this course we will teach you optimum strategy for playing in Sit and Go tournaments. To keep the number of lessons manageable we will not go into detail on basic poker strategy which is covered in other courses such as our How to Win at Poker Course.